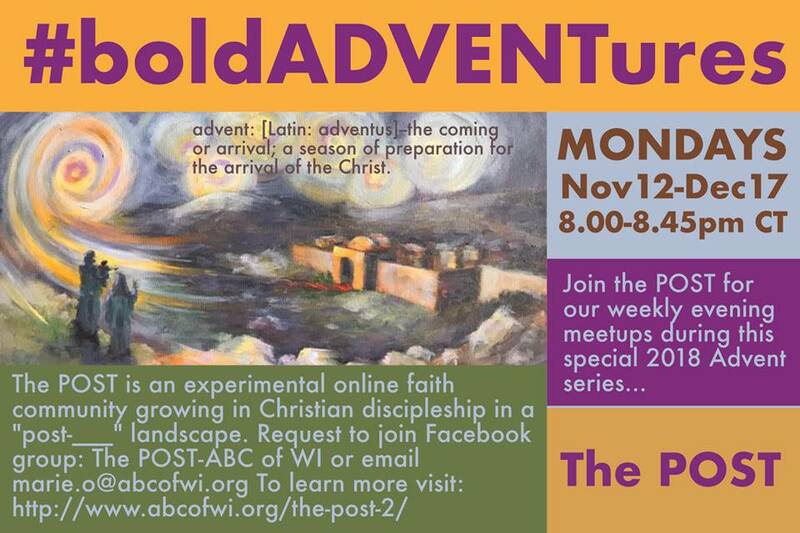 ​The POST is an experimental community of faith of ABC/Wisconsin that was conceived with consideration to various individuals on the fringes of the ABC/Wisconsin family, current challenges facing the Christian church including categories of people that are not currently fully engaged with existing congregations for a variety of reasons, and the possibilities of mission throughout the state. 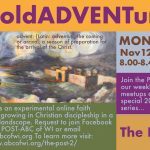 The POST currently meets online via Zoom on Monday evenings from 8-8:45 PM CT. If you have trouble joining, read our handy guide here. If you are interested to learn more, contact marie.o@abcofwi.org. To read an article by the Milwaukee Journal Sentinel run on August 15, 2016 about this experimental community, CLICK HERE. In 2017, the region's Executive Committee recommended a "ministry of conversation" priority to our current strategic endeavors. In essense, the committee articulated a priority to equip our region to engage in difficult conversations across human differences. This commitment was later affirmed by the Board at a subsequent meeting. Given that our mission statement highlights the affirmation of our diversities, and the experiences of such diversities vary greatly among individuals and communities, we have a unique opportunity to live out the unifying power of Jesus Christ among us in very real ways among ourselves and within our respective communities and spaces of engagement. Click HERE to read about the American Baptist Churches USA partnership with NWOC and the National Institute for Civil Discourse. Mutual Invitation – a conversation tool to foster equal opportunity for each person to participate in conversations. Respecful Communication Guidelines – “ground rules” for meetings and conversations. Can you imagine what it might look like for a group of people who combine biblical notions of ekklesia with the suggestions of one word rich in meaning to shape a community of faith that pursues Jesus-discipleship in ways that are alternative to brick and mortar churches? that serves as a signpost of sorts – where “un/displaced” people can connect and gain support, guidance, edification, and clarity of Christian purpose. that assigns and equips for designated posts – or jobs based on unique giftedness and passions for the work of God. that acknowledges and leverages online posting and interfacing capability – bridging participants together across geographical locales and physical isolation. that engages “post-_____ realities (-modern, -denominational, etc. )” – for a relevant foundation for spiritual formation and discipleship. that serves as a post for incoming and outgoing mission-related efforts – through deployment, debriefing and learning, and networking. 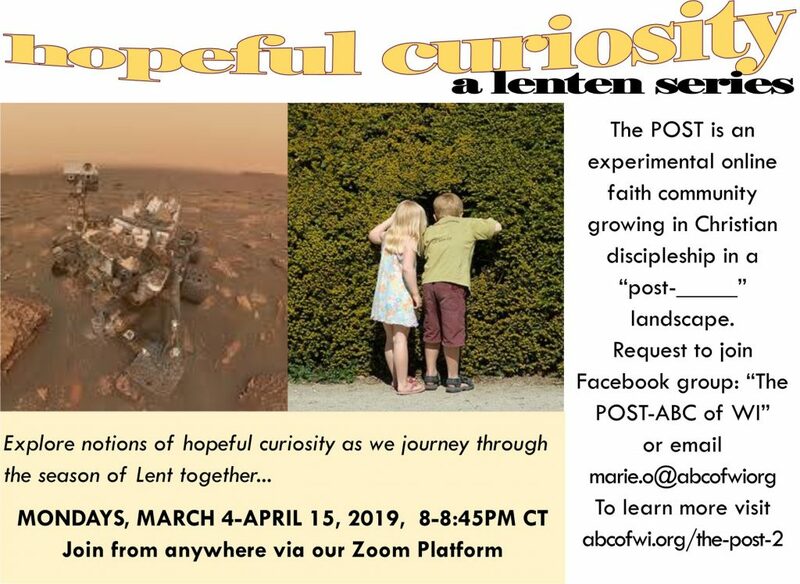 We are still in the forming stages, so if this resonates with you, contact me so we can converse more about how the POST may be an edifying stop on your faith journey. 1 Summarized from Cambridge online dictionary.